Galaxy Formation. Leading questions for today How do visible galaxies form inside halos? Why do galaxies/halos merge so easily? 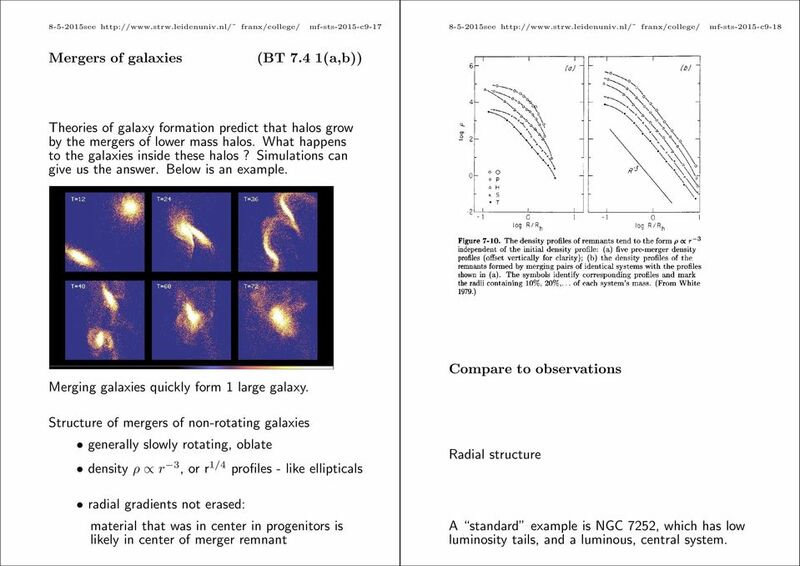 Download "Galaxy Formation. Leading questions for today How do visible galaxies form inside halos? Why do galaxies/halos merge so easily?" 5 see franx/college/ mf-sts-2015-c see franx/college/ mf-sts-2015-c9-10 Why do halos/ galaxies merge so easily? BT 7.1 abbreviated dynamical friction slows down two galaxies meeting each other even galaxies with hyperbolic orbits can merge! Dynamical friction consider massive point mass M, moving in sea of small point masses m the motion of the massive object will produce a wake behind it the wake is an overdensity, and will exert a force which slows down the moving massive object the wake is proportional to GM, hence the gravitational force on the object is proportional to G 2 M 2 The motion of the pointmass and the massive object is simply given by the solution for the two-body problem. m is the mass of small pointmass. M is the mass of big pointmass. v 0 is velocity difference at the start. v 0 = v m v M b is impact parameter. The deviations in velocity are v M, = 2mbv 3 0 G(M +m) 2 [ 1+ v M, = 2mv [ 0 1+ (M +m) b 2 v0 4 ] 1 G 2 (M +m) 2 b 2 v0 4 ] 1 G 2 (M +m) 2 the parallel deviation v M, will always be in the same direction, whereas the perpendicular component will be in a random direction. the friction can be estimated effectively by considering individual interactions between the massive object, and the small point masses Hence, as a result, when the contributions from all particles are taken (by integration), the perpendicular component can be ignored to first order, and the parallel component will dominate. 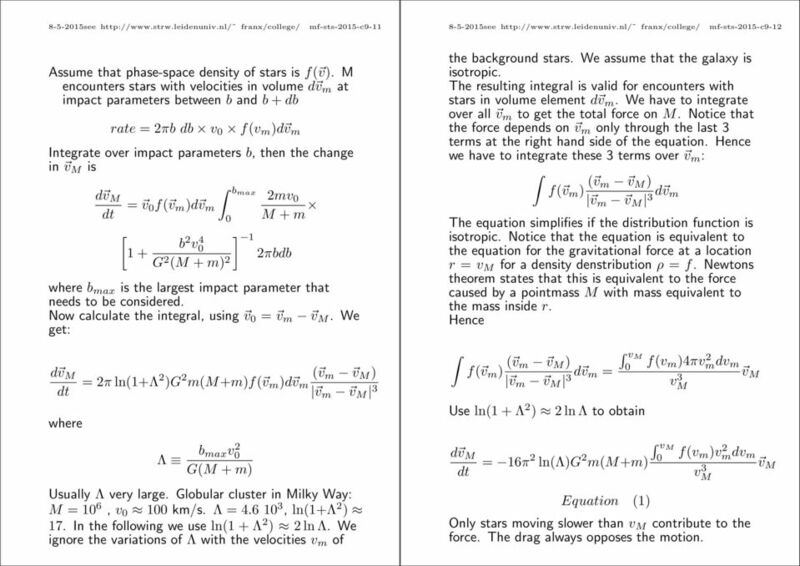 This will slow down the moving mass M.
6 see franx/college/ mf-sts-2015-c see franx/college/ mf-sts-2015-c9-12 Assume that phase-space density of stars is f( v). M encounters stars with velocities in volume d v m at impact parameters between b and b+db rate = 2πb db v 0 f(v m )d v m Integrate over impact parameters b, then the change in v M is d v M dt = v 0 f( v m )d v m bmax [ mv 0 M +m b 2 v0 4 ] 1 G 2 (M +m) 2 2πbdb where b max is the largest impact parameter that needs to be considered. Now calculate the integral, using v 0 = v m v M. We get: d v M dt where = 2πln(1+Λ 2 )G 2 m(m+m)f( v m )d v m ( v m v M ) v m v M 3 Λ b maxv 2 0 G(M +m) Usually Λ very large. Globular cluster in Milky Way: M = 10 6, v km/s. Λ = , ln(1+λ 2 ) 17. In the following we use ln(1+λ 2 ) 2lnΛ. We ignore the variations of Λ with the velocities v m of the background stars. We assume that the galaxy is isotropic. The resulting integral is valid for encounters with stars in volume element d v m. We have to integrate over all v m to get the total force on M. Notice that the force depends on v m only through the last 3 terms at the right hand side of the equation. Hence we have to integrate these 3 terms over v m : f( v m ) ( v m v M ) v m v M 3d v m The equation simplifies if the distribution function is isotropic. Notice that the equation is equivalent to the equation for the gravitational force at a location r = v M for a density denstribution ρ = f. Newtons theorem states that this is equivalent to the force caused by a pointmass M with mass equivalent to the mass inside r. Hence f( v m ) ( v m v M ) v m v M 3d v m = vm Use ln(1+λ 2 ) 2lnΛ to obtain d v M dt = 16π 2 ln(λ)g 2 m(m+m) Equation (1) f(v 0 m )4πvmdv 2 m vm 3 v M vm f(v 0 m )vmdv 2 m vm 3 v M Only stars moving slower than v M contribute to the force. The drag always opposes the motion. 7 see franx/college/ mf-sts-2015-c see franx/college/ mf-sts-2015-c9-14 This is the CHANDRASEKHAR DYNAMICAL FRIC- TION FORMULA (BT 7.1) for very large v M, one derives approximately dv M dt = 4πln(Λ)G2 (M +m)ρ m v 2 M Two interesting points: the drag depends on ρ m, but not m itself the larger M, the stonger the deceleration massive objects fall in faster than low-mass objects Dynamical friction for object with mass M in isothermal halo For mass M in orbit in isothermal halo one derives the following. The density in the halo is given by ρ = σ 2 /(2πGr 2 ) = v 2 c/(4πgr 2 ). 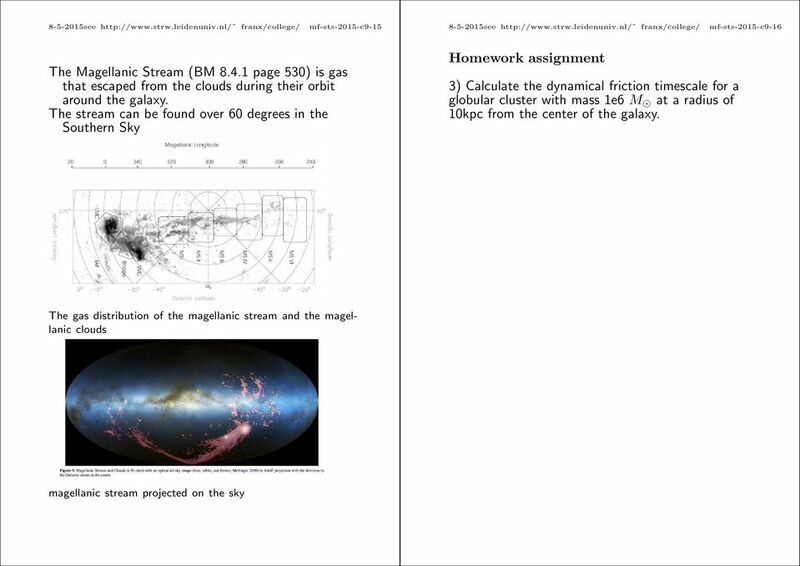 Fill this in the equation 1 above to derive: dv M dt = 0.428lnΛ GM r 2 Application to Magellanic Clouds (BT 7.1 1(b) The LMC and SMC have distances of 50 and 63 kpc, and masses of 2e10 and 2e9 solar masses. If our galaxy has a massive halo extending to the clouds, then the friction decay time can be estimated in the following way: The force causes the mass M to lose angular momentum per unit mass L dl dt = Fr M = 0.428GM r lnλ At all times L = rv c, and v c is constant. 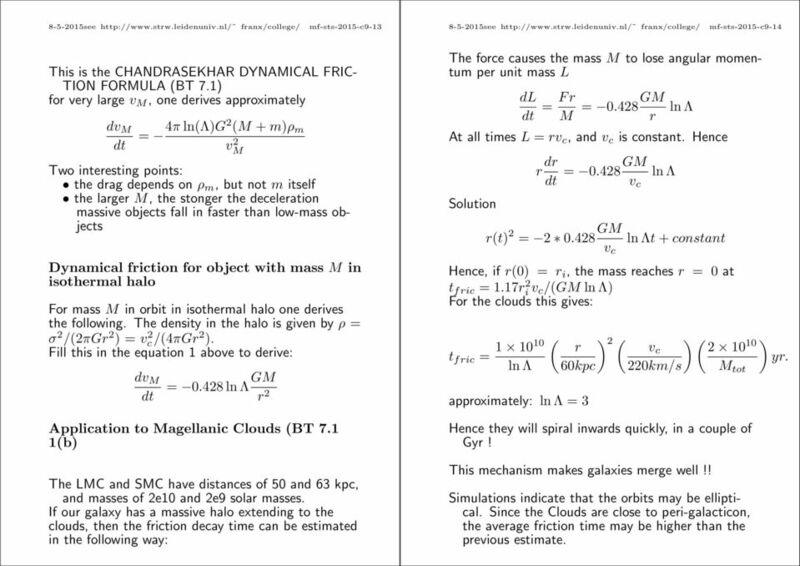 Hence Solution r dr dt = 0.428GM v c lnλ r(t) 2 = GM v c lnλt+constant Hence, if r(0) = r i, the mass reaches r = 0 at t fric = 1.17r 2 i v c/(gm lnλ) For the clouds this gives: t fric = lnλ approximately: ln Λ = 3 ( r ) 2 ( v c 60kpc 220km/s )( M tot Hence they will spiral inwards quickly, in a couple of Gyr! This mechanism makes galaxies merge well!! Simulations indicate that the orbits may be elliptical. Since the Clouds are close to peri-galacticon, the average friction time may be higher than the previous estimate. ) 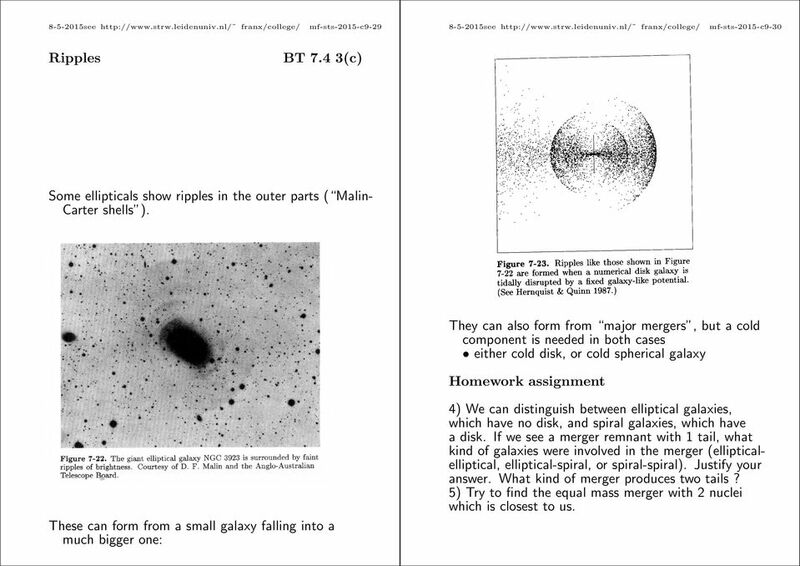 yr.
9 see franx/college/ mf-sts-2015-c see franx/college/ mf-sts-2015-c9-18 Mergers of galaxies (BT 7.4 1(a,b)) Theories of galaxy formation predict that halos grow by the mergers of lower mass halos. What happens to the galaxies inside these halos? Simulations can give us the answer. Below is an example. Merging galaxies quickly form 1 large galaxy. Structure of mergers of non-rotating galaxies generally slowly rotating, oblate density ρ r 3, or r 1/4 profiles - like ellipticals radial gradients not erased: material that was in center in progenitors is likely in center of merger remnant Compare to observations Radial structure A standard example is NGC 7252, which has low luminosity tails, and a luminous, central system. 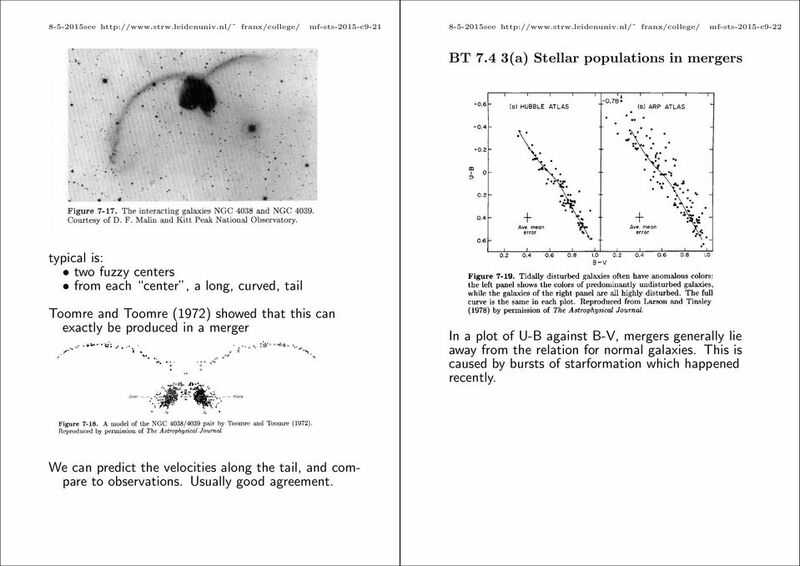 11 see franx/college/ mf-sts-2015-c see franx/college/ mf-sts-2015-c9-22 BT 7.4 3(a) Stellar populations in mergers typical is: two fuzzy centers from each center, a long, curved, tail Toomre and Toomre (1972) showed that this can exactly be produced in a merger In a plot of U-B against B-V, mergers generally lie away from the relation for normal galaxies. This is caused by bursts of starformation which happened recently. We can predict the velocities along the tail, and compare to observations. Usually good agreement. 12 see franx/college/ mf-sts-2015-c see franx/college/ mf-sts-2015-c9-24 How are these tails made in mergers? 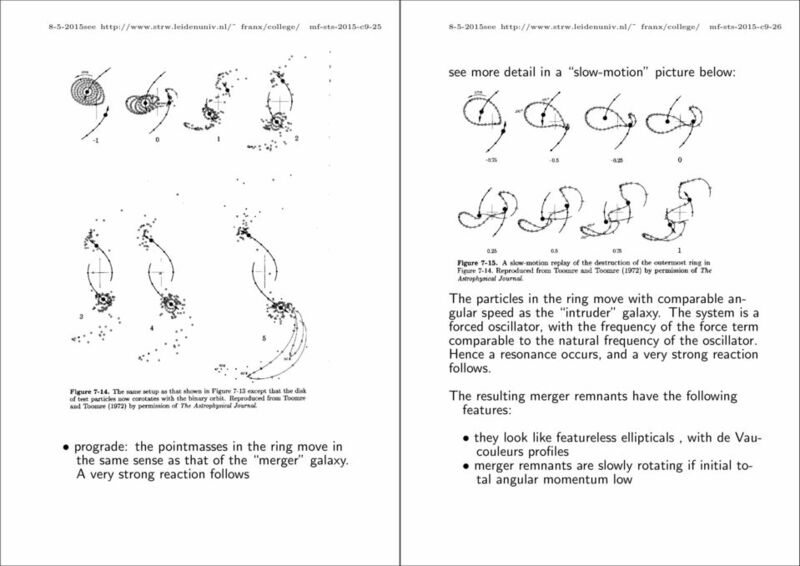 Mergers of rotating galaxies (BT 7.4 2) result depends on sense of rotation of disk: prograde: disk angular momentum pointing in same direction as that of orbit. retrograde: disk angular momentum pointing in opposite direction as that of orbit. Tails are formed by tidal forces. Each disk can produce 1 tail. Why is this? Model the merger as the encounter of two pointmasses, one with a set of rings around it retrograde: the pointmasses in the ring move opposite to that of the merger galaxy. They do not react very strongly, because sense of rotation opposite. 14 see franx/college/ mf-sts-2015-c see franx/college/ mf-sts-2015-c9-28 How efficient is merging? 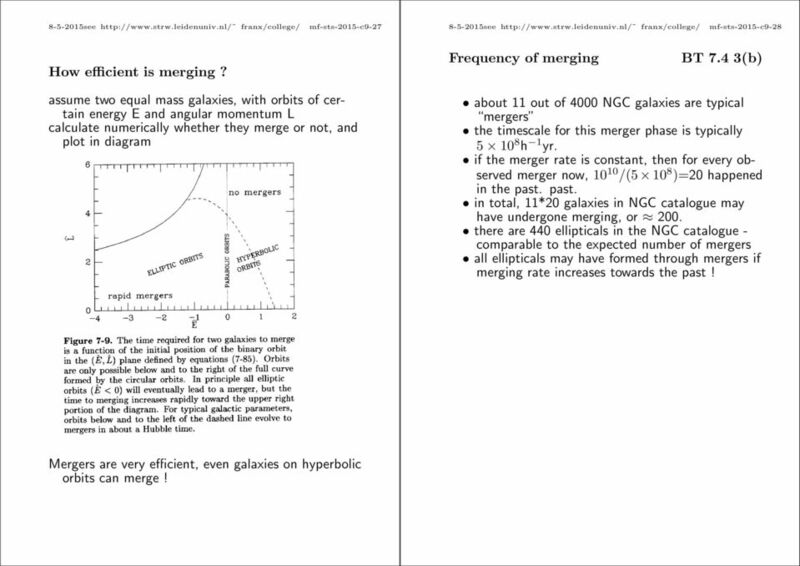 Frequency of merging BT 7.4 3(b) assume two equal mass galaxies, with orbits of certain energy E and angular momentum L calculate numerically whether they merge or not, and plot in diagram about 11 out of 4000 NGC galaxies are typical mergers the timescale for this merger phase is typically h 1 yr. if the merger rate is constant, then for every observed merger now, /( )=20 happened in the past. past. in total, 11*20 galaxies in NGC catalogue may have undergone merging, or 200. there are 440 ellipticals in the NGC catalogue - comparable to the expected number of mergers all ellipticals may have formed through mergers if merging rate increases towards the past! Mergers are very efficient, even galaxies on hyperbolic orbits can merge! 15 see franx/college/ mf-sts-2015-c see franx/college/ mf-sts-2015-c9-30 Ripples BT 7.4 3(c) Some ellipticals show ripples in the outer parts ( Malin- Carter shells ). 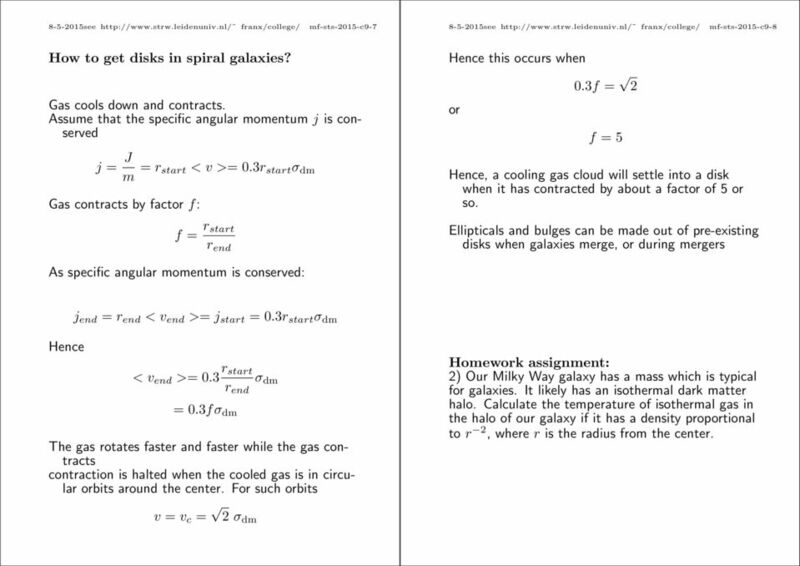 They can also form from major mergers, but a cold component is needed in both cases either cold disk, or cold spherical galaxy Homework assignment These can form from a small galaxy falling into a much bigger one: 4) We can distinguish between elliptical galaxies, which have no disk, and spiral galaxies, which have a disk. 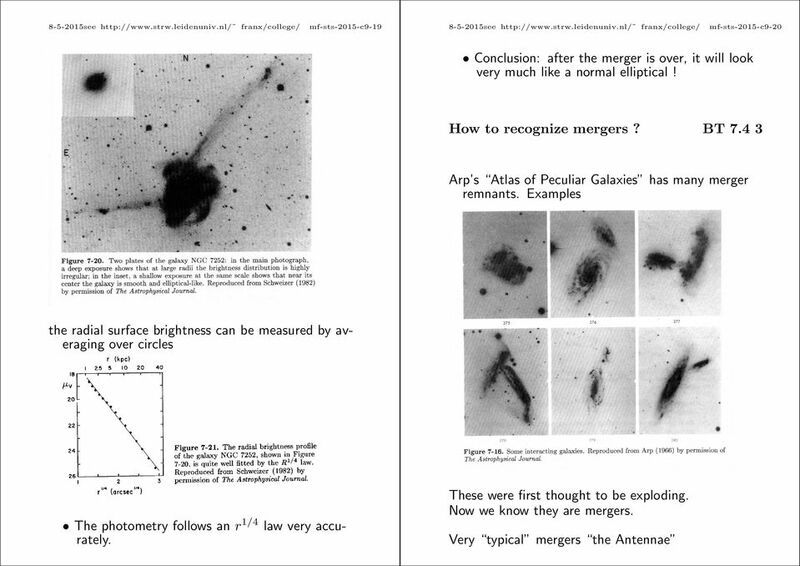 If we see a merger remnant with 1 tail, what kind of galaxies were involved in the merger (ellipticalelliptical, elliptical-spiral, or spiral-spiral). Justify your answer. What kind of merger produces two tails? 5) Try to find the equal mass merger with 2 nuclei which is closest to us. Evidence for Large Stellar Disks in Elliptical Galaxies. Andreas Burkert and Thorsten Naab Max-Planck-Institut für Astronomie, D-69242 Heidelberg, Germany arxiv:astro-ph/0101553v1 31 Jan 2001 Abstract. The Milky Way Galaxy. This is NOT the Milky Way galaxy! It s a similar one: NGC 4414. 1. 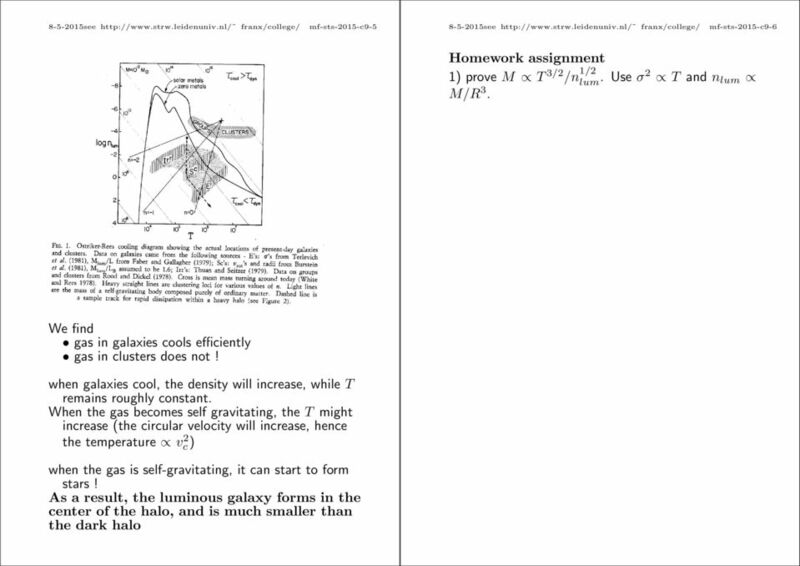 Gravitational forces and potentials (BT 2-2.1) Intermezzo: divergence and divergence theorem (BT: B.3) 2. Potential for spherical systems (BT 2. The formation of the galaxy is believed to be similar to the formation of the solar system. The Milky Way. The Milky Way. First Studies of the Galaxy. Determining the Structure of the Milky Way. Galactic Plane. In studying the Milky Way, we have a classic problem of not being able to see the forest for the trees. Lecture Outlines. Chapter 23. Astronomy Today 7th Edition Chaisson/McMillan Pearson Education, Inc.
How the properties of galaxies are affected by the environment? Learning Objectives. at the center of our Galaxy...why were they wrong? are globular clusters? Cepheid Variable stars? Astronomy Ch 23 The Milky Way. MULTIPLE CHOICE. Choose the one alternative that best completes the statement or answers the question. UNIVERSITY OF OSLO. Please make sure that your copy of the problem set is complete before you attempt to answer anything. 4/27/ Unseen Influences in the Cosmos. 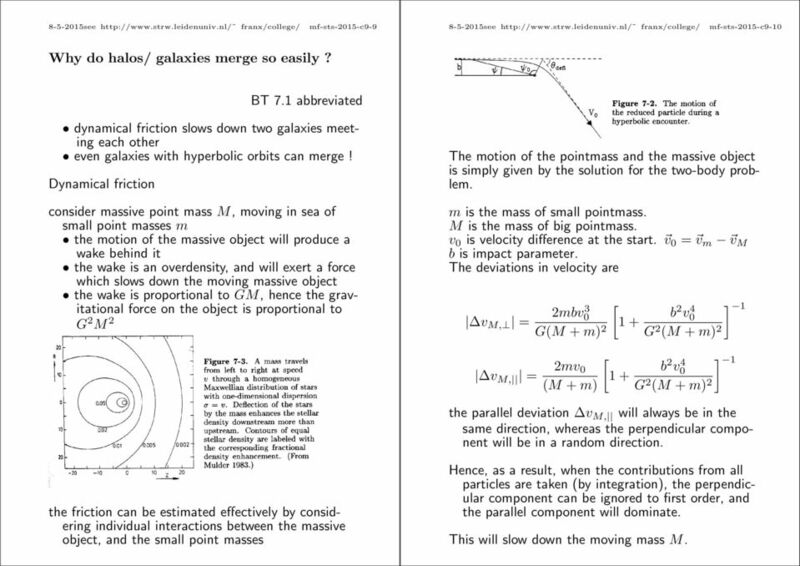 Chapter 18: Dark Matter, Dark Energy, and the Fate of the Universe. Spectroscopy, the Doppler Shift and Masses of Binary Stars. 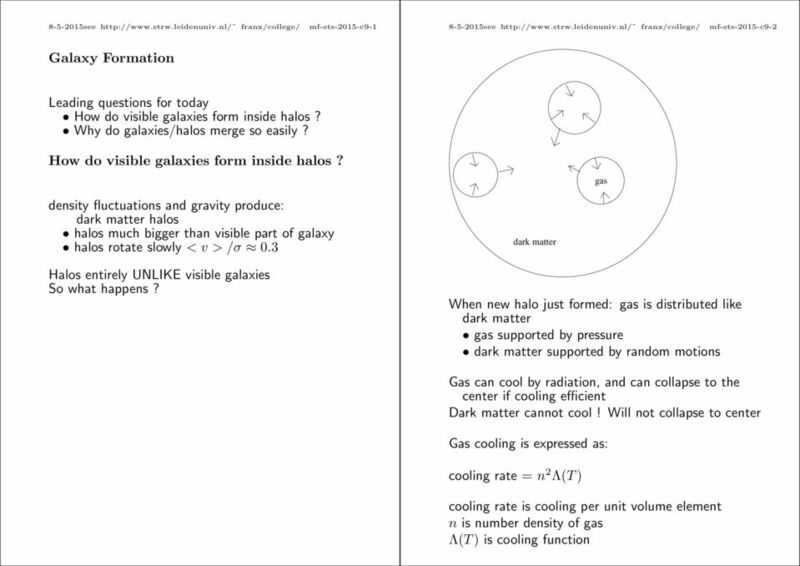 A Universe of Galaxies Today s Lecture: Other Galaxies (Chapter 16, pages 366-397) Types of Galaxies Habitats of Galaxies Dark Matter Other Galaxies Originally called spiral nebulae because of their shape. Notes: Most of the material in this chapter is taken from Young and Freedman, Chap. 13. Carol and Charles see their pencils fall exactly straight down. 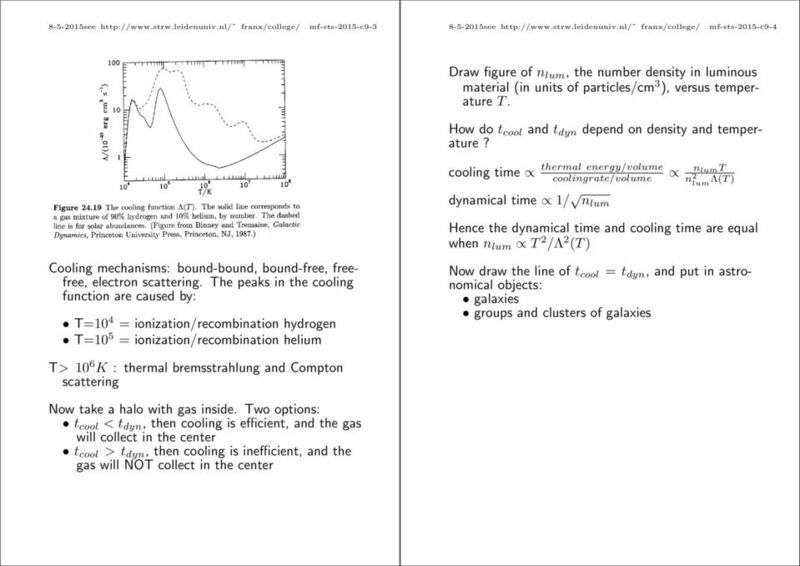 Ay 20 - Lecture 9 Post-Main Sequence Stellar Evolution. This file has many figures missing, in order to keep it a reasonable size.